How did you first get interested in science? Perhaps your parents took you to a planetarium and you saw the dance of the stars, or maybe you saw a PBS special on giant particle accelerators and knew you had to get your hands on one. All this is good scientific communication, where the abstract math and theory that rules our world is carefully explained to a more general audience. It is the responsibility of every scientist to effectively communicate their research to a general audience—you shouldn’t need a PhD to appreciate the sublime beauty of nature! After all, what good is a discovery if no one understands it? 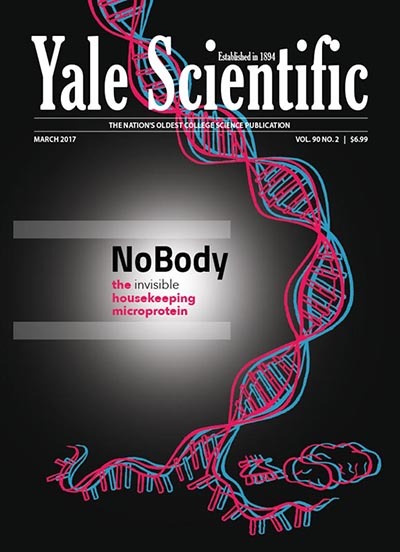 The Yale Scientific Magazine has a core mission to pursue clear and concise scientific journalism. Founded in 1894, the nation’s oldest college science publication is now completely run by undergraduate students and publishes four issues per year. Every issue features cutting edge research taken straight out of journal articles, but written in a way that is accessible to everyone. We have a drive to reach more people with the fascinating story of science, following the research by reading the original report, interviewing researchers, and discussing with section editors. Our magazine reaches thousands of people in print copy and hundreds of thousands online every year. There is no better place for aspiring physicists to become involved in scientific communication than in college. As a student, you have access to the scientists active in research and the time to understand their work. It may be easy to get started with your own blog, but don’t overlook traditional resources. Reach out to the chair’s office for your school’s physics department and let them know that you want to cover research from your university. Speak to your local newspaper, city or university, and ask for an article assignment. Look for research journals on campus, or even inter-university projects that help multiply the number of people who end up reading your work. Bringing new knowledge to the world is a great experience that all students should take part in during their undergraduate years. At the Yale Scientific, our writers find it remarkably fun to work on a piece, even on topics that are completely foreign to them. The process of scientific journalism is not always easy, but it is deeply rewarding and gives back to your local community. We encourage everyone to explore it, and to perhaps instill your wonder of the physical world to the next generation. Chunyang Ding is Editor-in-Chief of the Yale Scientific Magazine and is a sophomore physics major. Email ysm [at] yale.edu (Chunyang Ding) with questions, or online.